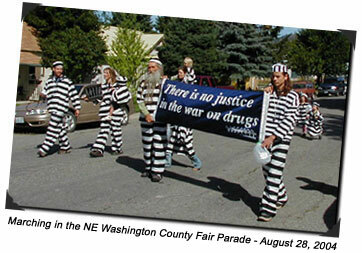 Changes in national drug policy begin with a local ground swell of awareness, arousal and action. 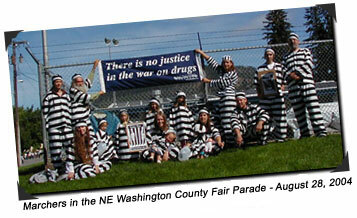 Use and adapt these ideas and tactics employed here in Colville, WA to bring about change where you live. Change begins in town meetings, with local elections, before large events, and especially when networks and affinity groups begin to take shape from the work you are doing. The following pages are dedicated to local efforts and will teach you how to be more effective in your community. Stevens County, Washington is a rural area where people work hard to raise their families. The people of this area cannot afford lavish spending on a 'state of the art' jail, as the supporters called it. Over fifty percent of the prisoners in Stevens County are non-violent offenders, making alternatives to prison immediately sensible. 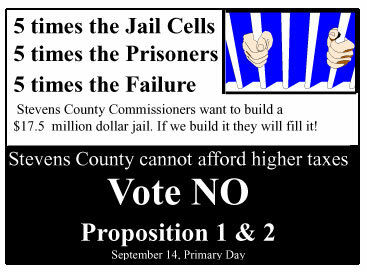 In November 2003, county commissioners called a public meeting to discuss the possibility of a new jail -- telling the local papers that the jail was imperative, the commissioners made their pitch. The meeting was where Robert "Bob" Glass presented his report to the public -- Robert Glass is a private prison consultant, who would profit off of every stage of the jail. "Stevens County needed a new jail", he reported. For more on Bob Glass, check out his website. The Spokesman Review newspaper wrote a story stating that, "Support for the new jail was lukewarm." After the meeting things were quiet for some time; we heard about meetings at the local diner -- early meetings and even though Nora and Chuck had signed up for notification of future meetings, and assured we'd be notified -- meetings took place and we weren't specifically invited. Lo and behold, seven months after the first public meeting, the county commissioners announced the issue was going to be put to an 'emergency' vote on the September primary ballot -- not the November ballot. This sad news came while we were moving our offices into the new building (a happy time).When we finished with our Issues and Strategies Conference on the Blue Moon (last weekend of July), we launched the campaign to stop the jail. And we had to hurry. Shortly after we began flyering cars, people began contacting us from the community. They supported our public education campaign. We formed an informal coalition of citizens from all over the political spectrum -- within Stevens County Washington. People from all walks of life saw that we were working hard to stop higher taxes for failed policies; they donated time and money, and supported two anti-jail advertisements for the local papers. When we looked at the issue we could see moral, financial, and civic arguments against the jail. Depending on the audience we were flyering, our hand-outs appealed to their civic, financial, and moral conscience. 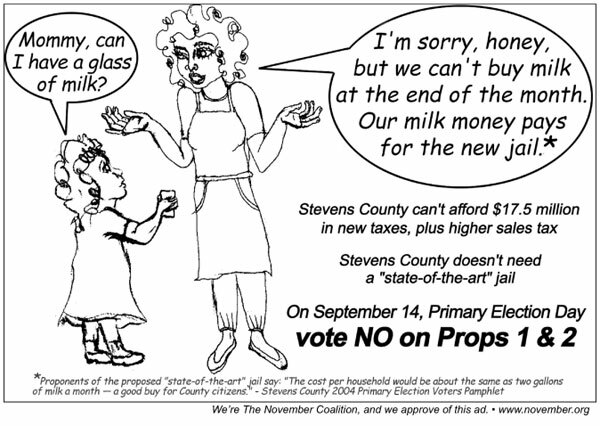 Good public messages make an emotional connection with the reader, and our flyers took issue with what would concern them most with the new jail. For more information on effective public announcements, down load a free copy of Why Bad Ads Happen to Good Causes. 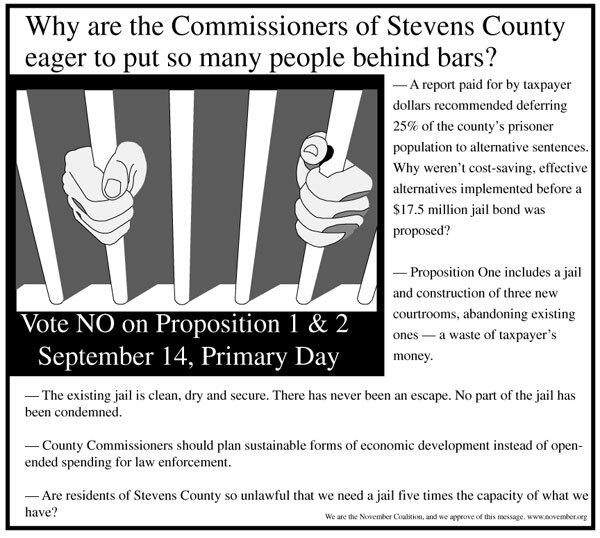 On September 15, we learned that the citizens of Stevens County voted against the new jail proposal by a margin of two to one. We are still waiting to learn whether the jail proposal will reappear on the November general election ballot.